1. Help spread God’s love and bring God’s glory in everything we do. 2. Remind everyone to have faith in God and to trust God by handing over your burdens in prayer and ultimately handing over your life to God. "So I say to you, Ask, and it will be given you; search, and you will find; Knock and the door will be opened." 3. Help others grow in their faith through fellowship and mutual support within the Christian community. "Keep watch over yourselves and all the flock of which the Holy Spirit has made you overseers. Be shepherds of the church of God, which he bought with his own blood." 4. Provide a path, through Faithware for personal involvement and encouragement to those who are struggling and to remind them of the faith community surrounding them. Faithware is a privately owned, faith-centered, for profit business. Faithware started in 2005 when, in the midst of many challenges, we were gifted this phrase. “Hand It Over”. It is a simple phrase but those three little words of faith can be life changing. To have faith in God is to trust God and to have confidence in God. Our lives, our futures, and our plans are in God's hands. 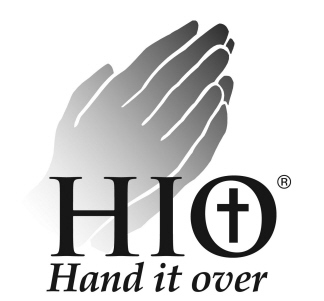 "HIO" reminds us to put our full and complete hope and trust in the lord. Faithware is a visible reminder of our hope. We believe prayer is one of the greatest blessings given to us. It allows us to talk to our Father anytime and anywhere, to hand over our all our burdens, to remove our anxiety and replace it with hope, faith and thanksgiving. We put "HIO" on our bracelets to remind us in an instant that the Lord is as close as a prayer. We do not believe there is "power" in our bracelets, but our bracelets remind us of the power that is available to us. I once read that "our meetings with each other, and our ministry to each other, are not chance happenings. They are acts of God's grace that give us a chance to share in God's blessing." We believe this and after presenting gifts of these bracelets to our friends, we decided to start Faithware and to make our bracelets available to all who might need to be reminded to "Hand It Over".